"No accidents. No coincidences. No escapes. You can't cheat death." 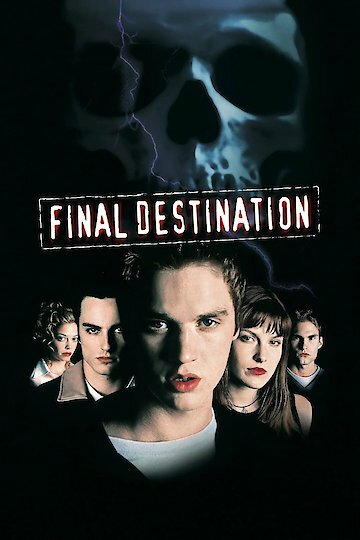 The Final Destination has continued far beyond the original 2000 film, offering us a new entry in the series every few years since the new millennium. Many of them are unrelated and self-contained stories, wrapping themselves up creepily and darkly at the end. As the later entries became more campy, the franchise distanced itself from its origins. Of course, this makes the original Final Destination an enthralling period of the times. The concept was uniquely original. Death, with its inescapable power, comes after you no matter where you run and hide. The film follows a young student named Alex Browning, who is to go on a field trip with some students in his class. while boarding the plane, Alex has a alternative-dream or vision, showcasing the plane crashing and everyone on board dying in a fiery blaze. He then "awakens" from this spiritual segue, and panicks. His panic leads himself, and his trusting fellow students off the plane. Of course, the plane does indeed crash, leaving the students alive and well, on the ground, and on to continue their lives. After some time, the students who were on the bus begin dying, one by one. The circumstances are beyond bizarre, and after a few deaths, Alex and his closest friend Clear contemplate that perhaps it was in their destiny to die on the plane. With some ruthless analyzing, the last remaining students realize that death itself is coming to them, and doing it in an orderly fashion- as the ones dying first her ahead in the plane and would have burned up first. The sleuthing culminates in a series of graphic and mesmerizing horror sequences. The film is violent, appropriately so, but death has no standards in how one is to die. The film perfectly encapsulates an inescapable villain. A villain not holding a knife to a throat, or cold-calling a home to scare a woman. No, this villain is an entity, destined to destroy and commit its only goal in existence- ending lives. The film makes for an absolutely thrilling roller coaster, playing with themes of destiny and fate, and trying one's absolute best to oversee the very force of death with free will. The film also set up a continuity that was followed for the next 2 Final Destination films, making for the beginning of a sort of pseudo-trilogy. But no film does the horror of inescapable death better than this original. Final Destination is currently available to watch and stream, download, buy on demand at Netflix, Amazon, Vudu, Google Play, FandangoNow, iTunes, YouTube VOD online.